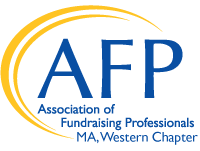 One lucky member of the Western Massachusetts Chapter of AFP will receive a Chamberlain Scholarship to attend the 2019 International AFP Annual Fundraising Conference being held March 31 – April 2, 2019 in San Antonio, TX. Please email your application to AFP WMA @ afpwma@gmail.com. Please note the discount is good for new members in the professional and associate category only. Already a member? Please consider forwarding this to a colleague who may benefit from membership in AFP and the connections and resources that provides.